Breathing fire with a butane cigarette lighter is a fun party trick that will liven up a crowd and draw attention to yourself. Surprisingly, blowing a ball of flaming butane out of your mouth is not as dangerous as it sounds, but looks very cool. Hold the lighter to your mouth and wrap your lips around the top, making an air-tight seal. Be sure to leave room for your finger to hold down the gas-release button. Allow your cheek cavity to fill up with gas. Do not swallow or inhale while the lighter is at your mouth. If you must breathe, use your nose but don't let your esophagus open. 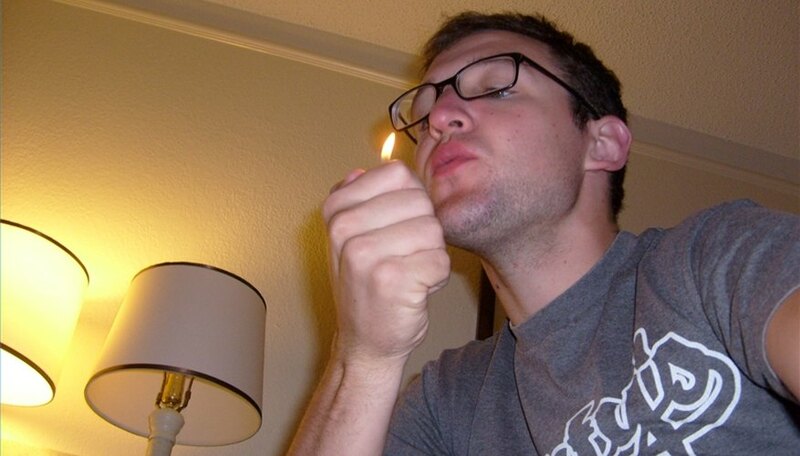 If your lighter produces a one-inch flame it shouldn't be at your mouth for more than ten seconds. 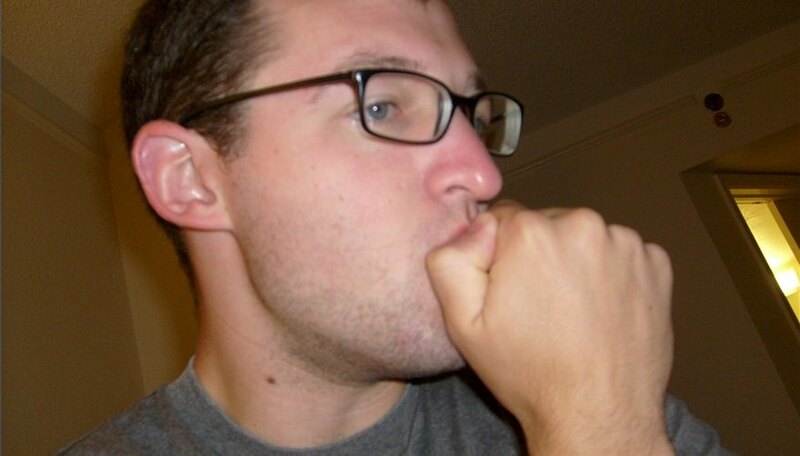 Take the lighter out of your mouth and close your lips so no gas escapes. Within five seconds of the time the lighter leaves your mouth, light it as close to your face as possible without burning your hair (about four inches or the width of a clenched fist). Purse your lips into a circle and blow quickly and gently, as if showing somebody how to blow out a birthday candle without extinguishing the flame. When you see the flame, close your lips so it doesn't get into your mouth. If it does get to your mouth, don't worry, your saliva will prevent the butane from burning anything. Remember, when fire burns it goes up. Make sure your head is angled slightly up so the fire doesn't go back into your mouth. Once the lighter leaves your mouth, quickness is key. If the gas settles before you blow it into the flame, the trick won't work. Learning this trick usually takes fifteen minutes or so of practice, so don't give up if you don't make a fireball on your first try. Protect your lips by licking them before starting the trick. 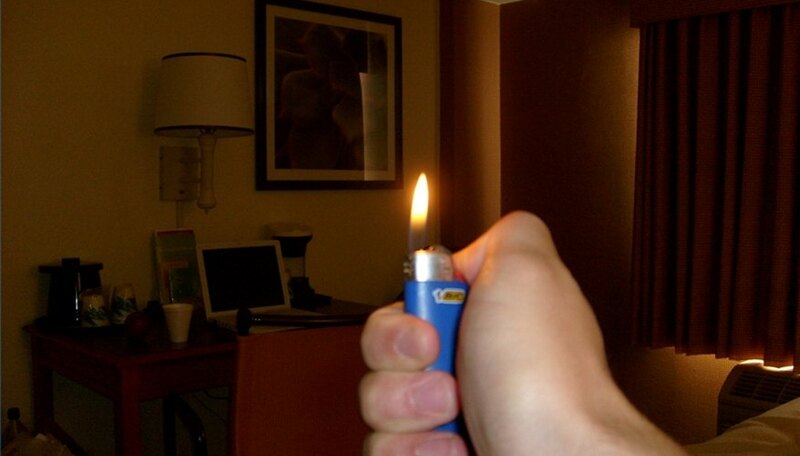 Select a lighter that can create a flame at least one-inch high. The larger the flame, the more butane is released each time you press the button, the faster your mouth will fill up with combustible gas. If the lighter doesn't release gas fast enough, then some of the gas will settle on your tongue and leave a horrible taste, as well as ruin the trick. Fire burns. If you have prized facial hair there is a chance it might get singed. If you swallow too much butane you'll probably get sick. If you inhale butane then expose it to fire it will ignite your lungs for a second. This could cause you to cough and may have more lasting damage, although the mucus lining of your lungs and esophagus will protect your vital organs from burns. In general, it is a good idea not to try this trick with anything but a cigarette lighter with a one to four inch flame, and never fill your mouth for more than ten seconds. Scott Wilson is a graduate of the University of Iowa, where he majored in English. Born in Des Moines, Iowa, he's been riding bikes, skateboarding and writing since he could pick up a bike, board or pen. His work has been featured in publications such as "Content Magazine," "The Daily Iowan" newspaper, "Farmhouse" magazine and "Creative Crossroads" magazine.